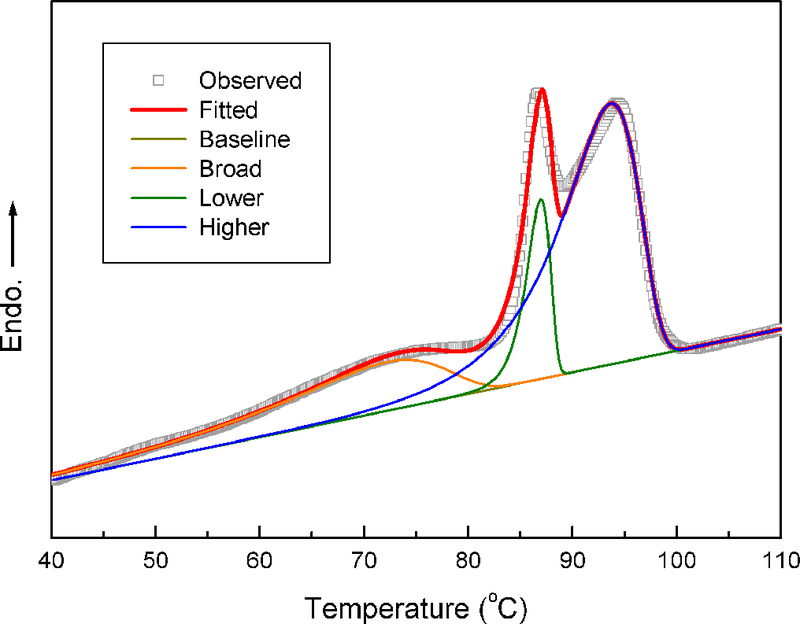 We have conducted computer simulation to understand the feature of the grain coarsening of polymer microdomains. 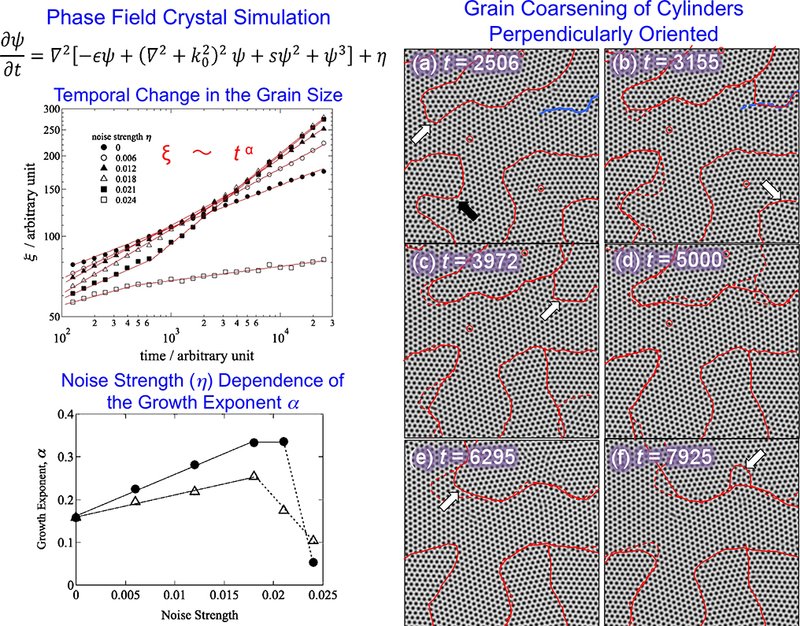 For this purpose, the phase field crystal model was utilized with the conserved potential field and perpendicularly oriented cylindrical microdomains were simulated, being evoluted from the disordered state. As a result, the power-law behavior was confirmed as the grain size is proportional to tα, where t is the simulation time. The growth exponent α was further found to be dependent on the noise strength ζ in the simulation. Two different power-law behaviors were found for early and late stages for all of the results except for zero noise strength for which a single power-law behavior was observed over the entire time range. α increased from 0.16 to 0.33 (for the late stage) with increasing noise strength. Although the result (0.16 ≤ α ≤ 0.33) contradicts our previous experimental result (α = 0.45) obtained by atomic force microscopy and small-angle X-ray scattering [Polymer Journal, 2017, 49, 655. ], simulated images are rigorously examined to understand the features of the grain coarsening. The following features are found. First of all, not only point defects but also line defects can exist in a grain. Both of them can trigger to create a new grain boundary or a small grain. Such formation of small grains was just transient so that they disappeared immediately. The reason why such transient grains are necessarily formed may be due to an instability in larger grains in the course of their growth. Such instability is caused by the localized energy due to a heavy distortion of the hexagonal lattice. As an example of the slow process of grain coarsening, it is suggested that slow movement of the grain boundaries can be driven by the change of the position of individual cylinders from the original grain to a neighboring grain. Furthermore, heavily curved grain boundaries are forced to be immediately straightened due to the high energy of the bent grain boundaries. Thus, we can recognize that the grain coarsening is driven by a dynamic movement and exchange of grain boundaries, as we have speculated in our previous publication. 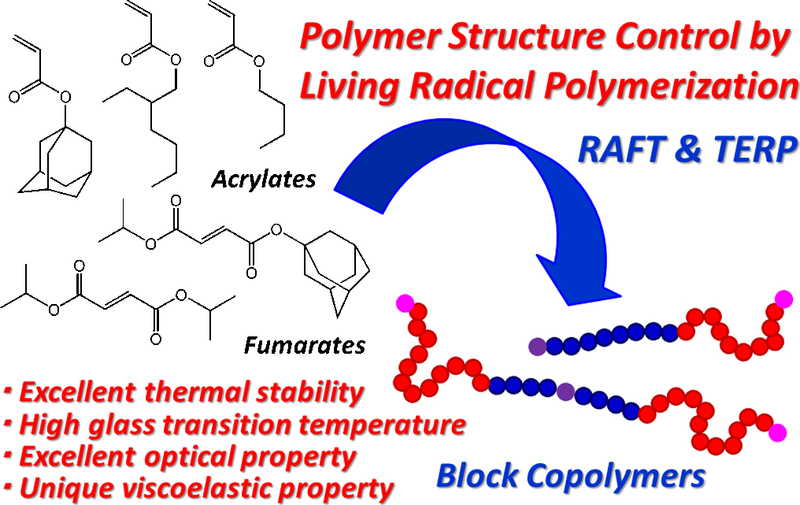 [Polymer Journal, 50, 1029–1042 (2018)]. 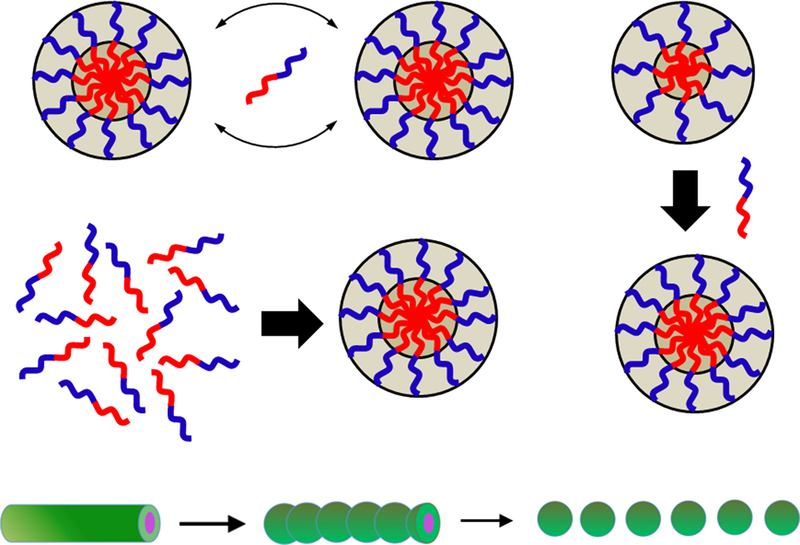 We overview both theoretical and experimental studies on the following kinetics of block copolymer micelles formed in a selective solvent reported so far: 1) the exchange kinetics of block copolymer chains among micelles was investigated by time-resolved small-angle neutron scattering for deuterated block copolymer micelles mixed with corresponding non-labeled micelles; 2) the growth of the micelles after a temperature jump was studied by time-resolved light scattering; 3) the nucleation-growth kinetics of the block copolymer micelles in solution was investigated by light and small-angle X-ray scattering using a stopped flow apparatus; 4) the morphology transition kinetics from cylindrical micelles to spherical micelles of block copolymers was studied by transmittance electron microscopy and time-resolved small-angle X-ray scattering. Sequential copolymerization of l-lactide (LLA) with ε-caprolactone (CL) followed by that of d-lactide (DLA) with CL was carried out to synthesize Poly(LLA-r-CL)-b-Poly(DLA-r-CL). The obtained Poly(LLA-r-CL)-b-Poly(DLA-r-CL) showed only one Tm ca. 30°C higher than that of Poly(LLA-r-CL), indicating selective formation of stereocomplex crystals. 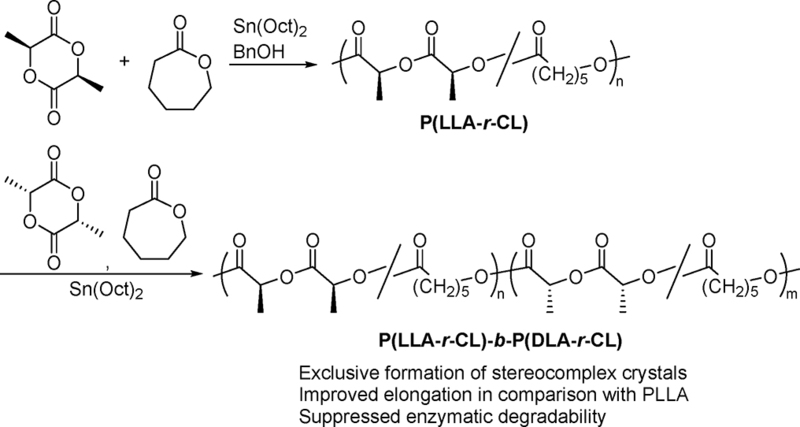 The stereoblock Poly(LLA-r-CL)-b-Poly(DLA-r-CL) exhibited high elongation at break similarly to homochiral Poly(LLA-r-CL). Their biodegradation test using proteinase K showed lower degradability than that of homochiral Poly(LLA-r-CL).